Posted by Amifur on August 07, 2018 . 0 Comments. The cultural significance of Russian hats started with the Finnish Army when the soldiers wore these hats to achieve optimum insulation in the coldest months of the Winter War. The design of the Russian hats stretching from the chin to the ears is one of the most efficient ones for winter purposes. Seeing the practicality of the army hats, soon the Soviet Army came up with the Ushanka to provide for prime warmth sealant. Shopping for Russian real fur hats is not laborious with Amifur’s online shopping website. While the hats may have started as Ushankas, they soon were capitalized upon by the fashion industry and several forms were invented. From Russian sable hat to Russian Cossack hats for men, the variety is flexible if you know to look at the right places. · How much price is too expensive? · What are the customer reviews? · Is it possible to make a wholesale purchase? · Is the fur faux or real? The inescapable question: How to wear a Russian Hat? 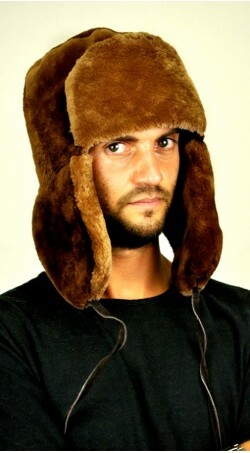 The ear flapped fur hats are a commoner version of the army Ushankas. They come in a variety of natural animal color’s like brown, beige, black and white. You can also opt for the fleece ones that offer prime warm comfort but are considered a little tacky. No matter what design you choose, there is a least possible chance of you feeling cold as the sizeable hat covers your entire ears, a good section of your forehead and your entire head. Russian Real fur hats are best worn with long solid coats and classic boots. Since the hats are the focus of the attire, it is better to go with dulled coat shades. For the ones who are not so formal and classy from the outside, choose a padded coat or a leather jacket and team it up with rugged biker boots and skinny jeans. For the ones who have a bob cut, there is a pretty good chance that the hat will entirely gulp the look. For the mid-length and longer hairs, make the most of it by leaving it down. Many choose to go with a low up do; however, the hat seems to go more with the freely moving hairstyles. Style your hair into wavy curls or poker straight strands for the best Russian hat look.